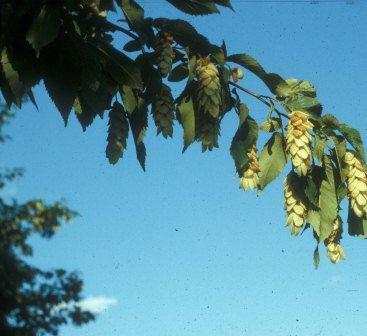 Ironwood (American Hop-hornbeam) is an over-looked native small tree in eastern North America, including the Northern Plains. 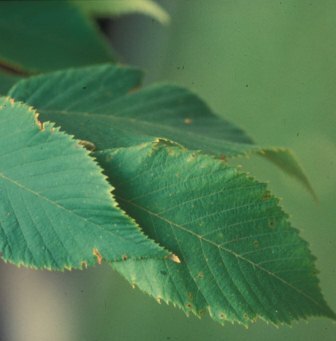 It is a member of the birch family, and winterhardy to USDA zone 3. This northern selection grows in an oblong-pyramidal form, slowly widening with age. Its branch habit is more upright than typical for the species. Its dark-green summer leaves change to golden-yellow in autumn, and approximately 50% cling on the tree into the winter, adding coppery-brown hues to the landscape when trees are dormant. Sun Beam™ Ironwood grows 30 to 38' in height in 35 to 40 years, depending on site conditions. Mulching may speed growth rate somewhat, due to better growing conditions. 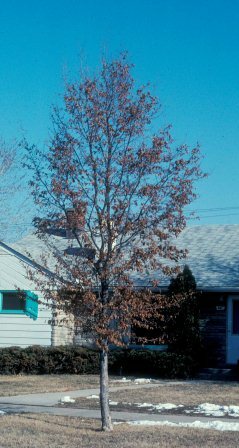 Increasing interest is being shown in this native, smaller tree for landscape uses, including yards, parks, golf courses, boulevards and naturalized areas. Male catkins and hop-like fruits add additional winter interest plus its strippy bark tends to exfoliate. This cultivar performs well in northern areas where sites are not too droughty. It is probably best planted balled and burlapped or container-grown. Good success has been achieved on the NDSU campus using bareroot plants that have been sweated-out. Vegetative propagation is not easy, but softwood cuttings can be rooted in late June to mid-July. Grafting and/or budding methods have also been successful. Propagation materials are best collected from more vigorous growing juvenile trees. Wholesale nursery propagation is encouraged. Plant propagation material can be obtained from NDSU Plant Sciences Department or trees from licensed nursery subject to availability. This cultivar is available for non-exclusive licensing.